"We are made aware that Thistle had some encounter with the Drath in her mysterious past. Part of me wondered if there was some illegal spellwork involving Gwen in the flashback. The witch decided to use Thistle as the sacrifice to bargain with the Drath. This is eventually foiled by the Light Beings which allow the heroine to escape into the night. But she's already been tainted. This is helped out with the fact that the Frog Drath seemed to know who Thistle was. 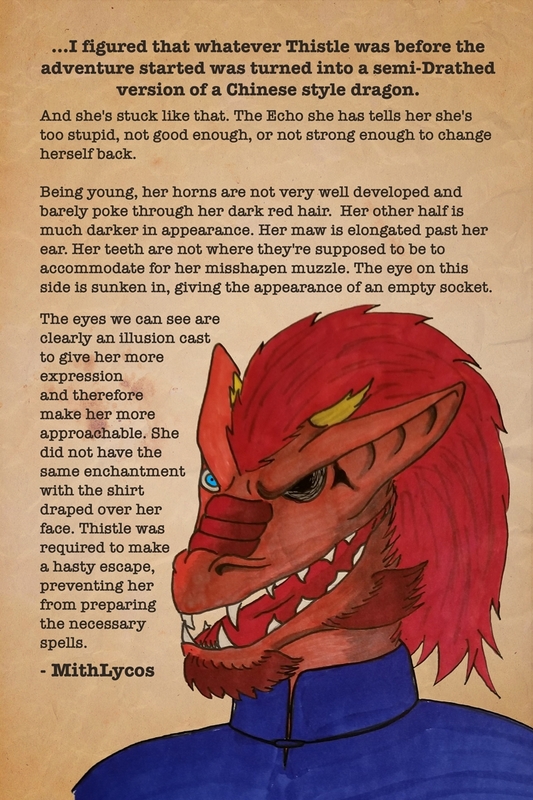 "So I figured she had some sort of obvious deformation such as discolored eyes or empty eye sockets, an eerily elongated mouth or irregular teeth, misshapen limbs, and the claws. The end result had to have been enough to scare the pants off of anyone, including the cave elf. "That in mind I figured that whatever Thistle was before the adventure started was turned into a semi Drathed version of a Chinese style dragon. And she's stuck like that. The Echo she has tells her she's too stupid, not good enough, or not strong enough to change herself back. "The image I had in my head was a humanoid dragon. One half of her is pretty straight forward. She's a red skinned Chinese dragon. Being young, her horns are not very well developed and barely poke through her dark red hair. "Her other half is much darker in appearance. Her maw is elongated past her ear. Her teeth are not where they're supposed to be to accommodate for her misshapen muzzle. The eye on this side is sunken in, giving the appearance of an empty socket. "The eyes we (the reader and possibly the others) can see are clearly an illusion cast to give her more expression and therefore make her more approachable. She did not have the same enchantment with the shirt draped over her face. Thistle was required to make a hasty escape, preventing her from preparing the necessary spells." I AM 10000000% ON BOARD WITH A COOL ZOMBIE MALFORMED DRAGON CREATURE, THAT IS THE COOLEST THING IN THE UNIVERSE, SOMEONE PLEASE WRITE THIS STORY. Please also make sure to check out MithLycos' deviantArt gallery!